I want to take you guys back...wayyyyy back...to 2012. Back before Wilder was more than a little bean in my belly and we were just embarking on the renovation of our second old house. I've told you about the Bryant House before - how we moved into it on a whim and how leaving it was really sentimental for me - and now I want to show you one room in more detail: the kitchen. Not awful, but it sure wasn't great (as you can tell from my disappointed expression). Once we lived in the house for a couple of months we realized the closed-off space just didn't work for us. So the kitchen had to go. We had the foresight to wait until I was really pregnant to tackle this renovation, which meant I sat out of the demo and all the heavy lifting - not a bad deal for me. We gutted all but a small bank of original cabinets, removed the wall that closed off the dining space, and sold all the appliances on Craigslist. We added two sliding doors to capture the light and the territorial views. Then we began putting the kitchen together - cabinets, backsplash, plumbing, electrical, appliances, and so on. Once again, we did all the work ourselves. These subway tile backsplash was a lot easier to install than the Ravenna Houses's marble herringbone backsplash. Mostly because they came on 12"x12" sheets and didn't require any diagonal cuts. The Bryant House's kitchen has new, custom cabinets with the exception of the the original bank of drawers and glass uppers that were in good enough shape to keep. We selected maple butcher block countertops because it's classic-looking, easy to DIY, and Uncle Dougie hooked us up with a good deal. To keep the traditional look going, I used Martha Stewart hardware (here and here). For the dining nook, we built in a storage bench with a cushioned top to maximize seating. There was originally a cabinet over the bench, but we removed it to make space for open shelves. The dining nook has windows or doors on three sides, making it the brightest spot in the house. 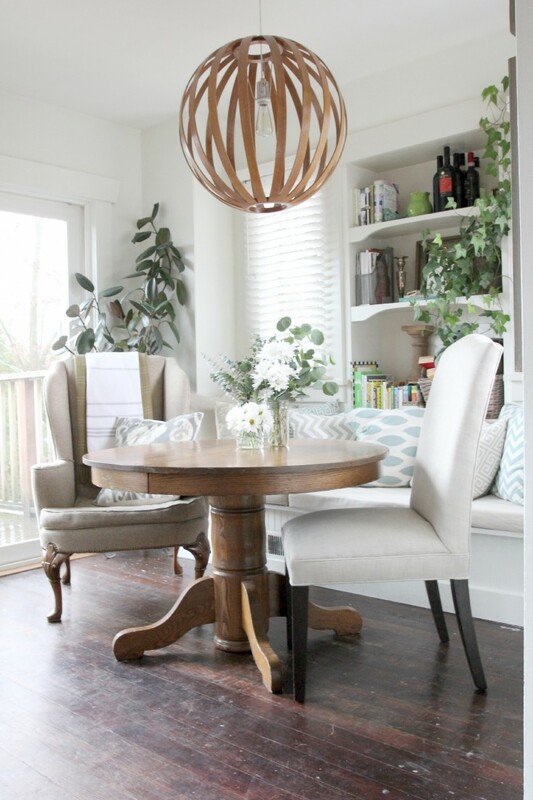 That chandelier is from West Elm - I have a thing for their lighting! 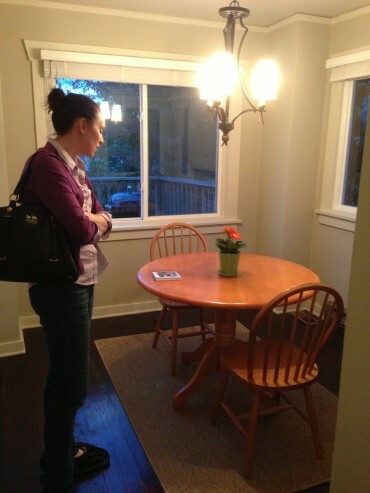 All the furniture is vintage except the armless chairs from Restoration Hardware Outlet. The stainless steel cart can be found here and the industrial faucet here. The Bryant House's kitchen is probably my favorite renovation we've ever done, especially the dining nook. It's the brightest, coziest spot to relax in the morning with a cup of coffee or in the evening with a roudy crew for beer. And I have a real sentimental attachment to this space since I spent so much time here with Wilder when he was just a wee-guy. Oh I miss that kitchen. p.s. I'm pretty obsessed with adaptive reuse and this army-administration-building-turned-home is a perfect example! Bonus: it's for sale! p.p.s. What eating ice cream for the first time looks like. p.p.p.s. We've been working on our backyard remodel at the Ravenna House. I'm dreaming that our space turns out something like these...any one of them!